I teach Frankenstein in a course that’s called Our Monsters, Ourselves and one of the perspectives that informs my teaching is feminism, which for some students is surprising – a student once said to me, “You’re a feminist? But you’re so calm,” as if somehow, those two things are mutually exclusive. Over the years I’ve noticed that when talk about feminist politics or gender roles in literature classes, students often assume that discussions of gender are always only about women. It’s as if by default “gender” must refer only to women because it’s only for women that “gender” is a problem. When I want to talk about a text from a feminist perspectives, however, frequently students will say that this or that text can’t be feminist, because they’re looking at the text for role models. For example, they’re looking for the female characters in a novel to be strong and noble and good and successful and so forth. But “role models” don’t necessarily make a text feminist, and that’s one of the ways that I use Frankenstein in class: to show that the absence of something can nonetheless be something. Primary Collection, NPG 1235. Used by permission. 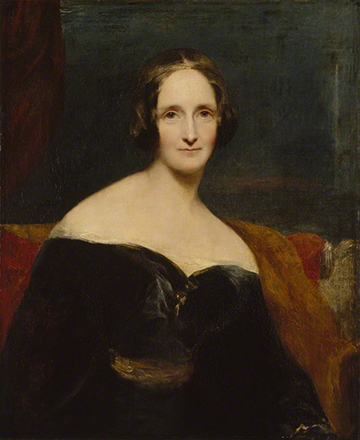 My teaching of Frankenstein is indebted to the work of the literary scholar Anne Mellor, who argues that Frankenstein is, in fact, a feminist novel. Students, however, often seem to be perplexed by this idea. They say: “But there are no major women characters. Elizabeth, the fiancée of Victor Frankenstein is a marginal character. She’s not very important. So how can it be feminist? Because there are no women in the novel, really.” The students are correct: women are, in some ways, peripheral to the novel’s main plot lines. And yet at the same time, of course, women are central to the text precisely because they’re not there. She who, in all probability, was to become a thinking and reasoning animal, might refuse to comply with a compact made before her creation. They might even hate each other; the creature who already lived loathed his own deformity, and might h he not conceive a greater abhorrence for it when it came before his eyes in the female form? She also might turn with disgust from him to the superior beauty of man; she might quit him, and he be again alone, exasperated by the fresh provocation by being deserted by one of his own species. What Victor fears is that the female monster, were she to be created, would have autonomy, that she would decide, “I don’t want to be part of this bargain. I don’t like this other creature I’m supposed to be a companion with. I hate him.” In other words, he’s afraid that she might have her own way of thinking. Female autonomy, in Victor’s eyes, becomes a terrible threat. The second thing he’s afraid of, of course, is that “one of the first results of those sympathies for which the dæmon thirsted would be children, and a race of devils would be propagated upon the earth, who might make the very existence of the species of man a condition precarious and full of terror.” So the second problem with the female monster is that the female monster and the male monster might breed and create more monsters. And, of course, Frankenstein has been interested in creating things all by himself, with no women involved whatsoever. So it’s either that the woman monster will reject the creature’s plan for her and think on her own or that she will decide to breed. Both of those prospects are terrifying. And so he destroys this almost-finished female creature, much to the dismay of the original creature, who vows vengeance on Victor because Victor has doomed him to a life of loneliness and despair. The absence of the female monster, and the chain of events triggered by her absence, helps me to talk with my students about how that absence matters. And then we talk about the function of this absence –and the absence of the other women in the novel (for instance, the mothers in this novel are all dead; Elizabeth, Victor’s long-suffering fiancée has very little influence on Victor, or on the plot). What happens as a result of trying to sidestep the female part of creation or propagation? What happens when you marginalize women, when you attempt to keep women on the sidelines? When we think about it that way, the novel helps students to start to think about the fact that to be “feminist,” doesn’t necessarily have to be about the creation of . . . say, Wonder Woman. Feminist politics can exist in the absence of any kind of “role model.” The feminist politics of Shelley’s novel exists in the critique of Frankenstein’s decisions to create a masculine mode of reproduction: he creates the male creature, he creates and then uncreates the female creature. It’s that absence that creates the monstrosity that ultimately undoes Frankenstein. Thinking about the absence of women in this fashion helps us to see that the novel is not necessarily about finding answers but is about asking different sorts of questions: about the nature of society, about the nature of creation, about the power of the environment to shape character, about the relationships between men and women, individuals and society. Deborah Williams is Clinical Professor of Literature at NYU Abu Dhabi and a member of the Liberal Studies faculty at NYU in New York.